Here is a fun idea for a quick Christmas card. Try looking at your non-holiday stamp supplies in a new light. These little trees are actually the body of a little lady image. So get thinking "outside the box." I hope this card inspires you to stretch your supplies and your creativity. Happy Holidays! 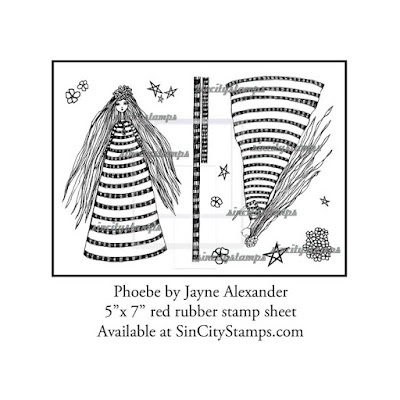 Stamp both Phoebe lady stamps onto white card stock with black ink. Color the body of one which will become a tree. Next, fussy cut all 3 trees. Punch 3 stars with a paper punch from white card stock. Use a black marker to outline 1 star. Add a bit of black card stock to form a tree trunk and adhere the middle tree with foam tape to the center of the card. Add a bit of green card stock to form tree trunks, assemble the white trees, and attach to each side. Stamp a checkerboard border with black ink and attach along the bottom edge of the card. Finally, use black ink to stamp clusters of stars around the Christmas trees. That is so cool Karen! The "Phoebe" stamp is so flexible! Love it!